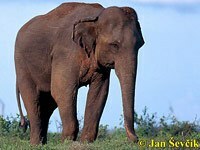 Asian elephants are smaller than their African counterparts, most easily noted in their ear size. 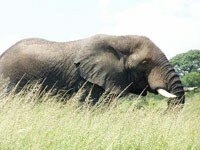 They are more readily tamed than African elephants and have been used as beasts of burden for centuries. Despite their size, their charge speed can reach nearly 50kmph. Wild bulls are solitary, while cows and calves live in small herds. Though the adult Asian elephant has no natural predators, there are only around 50,000 left in the wild. 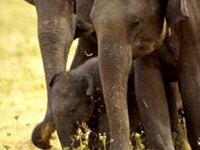 How long do Asian elephants live? What's the use of the trunk of an Asian elephant? 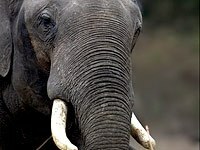 Why do an Asian elephant have tusks? Elephants use their tusks to dig for roots and water, strip bark from trees, and even fight each other. Unfortunately their ivory has gotten them into a lot of trouble. 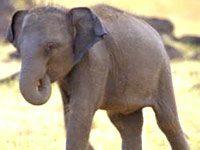 What does the Asian elephant eat? 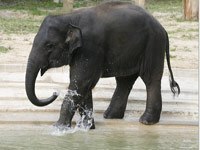 Download free Asian Elephant wallpapers, click on the image to open the large version. Print free Asian Elephant coloring pages, click on the image to open the large version.